Good morning from beautiful downtown San Francisco, this is Chief Storyteller of Wine.com speaking to you from the heart of the city’s financial district on the eve of one of California wine’s greatest moments. Today we announce the release of the 2012 Caymus Vineyards 40 Anniversary Cabernet Sauvignon. 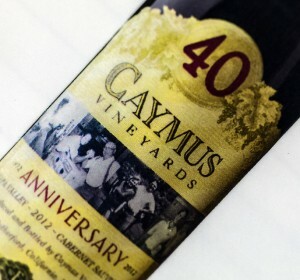 Looking back over 40 years of incredible history, Caymus produced its first vintage in 1972, a rain-soaked year in which so many Napa Valley Cabernets went to the wayside. Yet the Wagner family succeeded in bringing to market a wine of great depth and richness that became a benchmark for California Cabernet. Now fast forward to the present and we find the wonderfully rich and opulent 2012 available for our collections. From my notes, the 40th Anniversary Cabernet once again stands tall as wine that will ultimately represent one of the vintage’s best efforts. In a staff tasting, we found the wine opulent and long lasting. Dancing on edge of overt black fruit, the wine stays close to home with its unmistakable dustiness. I first met Chuck Wagner around 1975, when I tasted the legendary 1973 Caymus Vineyards Cabernet Sauvignon. I have had the pleasure of tasting nearly every one of the winery’s 40 vintages and was so happy to experience the 2012. Happy 40th to the Wagner Family and all that you have done for the California wine industry.